Butwal, Minister for Social development, Hon. Sudarshan Baral of province No 5 has said that there is a need for institutionalizing the achievement of the long struggle of workers, Addressing the program organized on the occasion of the 40th Establishment Day of the Whole Industry Trade Union, Nepal in Butwal. Chief Guest of the program, Minister Baral said "The employers and the industrialists should abandon the tendency of low pay & seek for high profit. Minister Barlal emphasized, by organizing skill training to the workers, industry can increase the production & further informed that Government is planning to organize tripartite discussion, between the government, trade unions & industrial. Minister Barlal also congratulated & extended best wishes on the occasion of the WHIN 40th establishment day. In the program, GEFONT Vice President Cde. Kamal Gautam has explained the social security program. He further said "there should be common understanding on contributory Social Security Scheme." He emphasized that if the Social Security sheme implemented effectively, it will bring prosperity in lives of the working class & GEFONT is always in favor of the development & expansion of the Trade Unions, he further highlighted. GEFONT Secretary Cde. 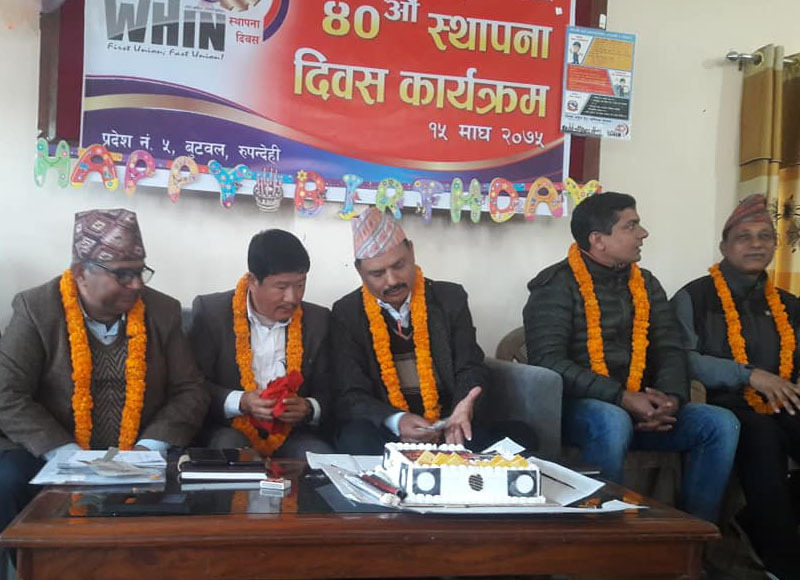 Damodar Sapkota, Said" on the special occasion of the 40th Establishment Day of WHIN, he extended his wishes that none of the workers have to go to labour department & office with the complain of their wages and facilities. Likewise, in the program Deputy Mayor of Butwal sub metropolitan Ms. Goma Devi Acharya, informed that the Butwal sub-metropolitan decided to keep a labor desk soon just after clearing some of the issues after that it will be easy to address the workers issue. Similarly, in the program GEFONT NEC member Ranju Bhattarai, said that the new Labor Act 2074 has integrated both formal & informal workers so workers should unite for its effective implementation. Meanwhile,WHIN secretary Cde. Arjun Chaulagain briefed on the history of the union since 1979. He further informed that WHIN will formulate the plan for next 10 years by reviewing its 40 years history.